Most dogs are prone to getting tangles and knots, especially those with long, silky coats. To prevent dead hair, dirt and loose fur from becoming a serious problem, regular grooming is required. Still, even if we brush and wash our canine companions properly and regularly, coat problems can happen. And when serious mats start developing? If you don’t own a proper dematting tool, good luck keeping your furry friend calm while you try to untangle his coat-mess! Thankfully, there are many excellent dematting and detangling combs, brushes and tools on the market that can help you get the job done quickly and efficiently. To help you find the best dematting tool for your dog, we read about different products, tested a bunch of them and came up with a top 10 list. Read on to find the right tool for you and your four-legged friend. We start with one of the best dematting tools on the market – the GoPets Dematting Comb with a two-sided professional grooming rake that can be used for both dogs and cats. 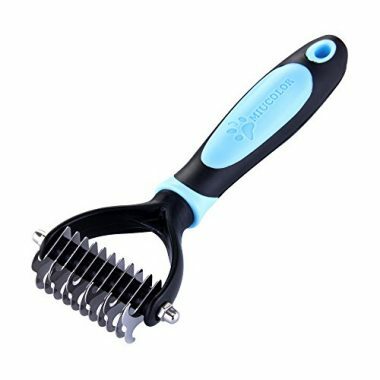 This comb makes grooming your dog a piece of cake, as its double-edged stainless steel rakes go through messy coat, tangles and mats easily and efficiently. The grooming tool has a different number of teeth on each side, so you can use the lower density (12 teeth) for those stubborn tangles and mats, and the higher density (23 teeth) to control shedding. The comb is efficient but gentle as it has sharp teeth that prevent hair pulling and rounded ends that make detangling safe even for dogs with sensitive skin. As for the handle, it’s made of non-slip silicone gel that conforms to the user’s grip. An affordable but highly efficient dog dematting tool, the Pat Your Pet’s comb features a 2-in-1 dual head: one with 9 teeth that can be used for tangles and mats, and the other with 17 teeth that can be used for deshedding and thinning. This dog detangler’s inner side of the teeth is sharp enough to smoothly cut through the stubborn matts, while the no-scratch rounded teeth’s outside is gentle to the skin, promoting circulation. As for the material of the teeth, they’re made from no-rust, durable stainless steel. 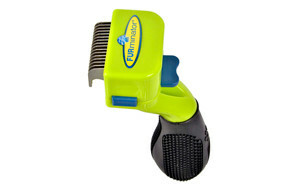 The handle is ergonomically made and has soft, anti-slip grip that ensures comfortable combing. All in all, a great grooming tool for medium and long haired dogs. 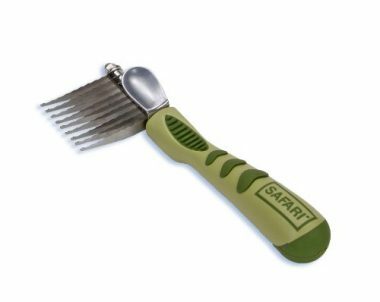 If you’re looking for an affordable, good-quality dog grooming tool, look no further than the Safari De-Matting Comb. 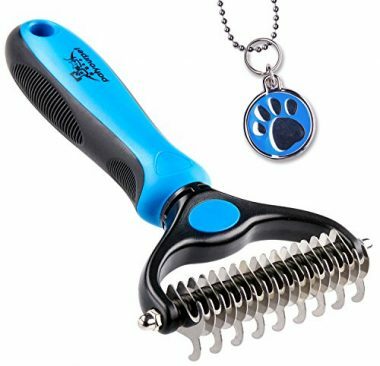 This dog detangler’s rake is made from stainless steel so quality is guaranteed, and combing through mats and tangles is made a cinch thanks to sharp, serrated teeth. But no worries, the comb is gentle too, thanks to the rounded ends on each blade. A perfect tool for all those beautiful but high-maintenance coated canines! The handle is made from an anti-slip rubber that easily fits in the hand and is comfortable to use. As a bonus, the blades can be reversed for left-handed use, so you’ll have no problem using this particular grooming tool if you’re a righty or a lefty. If you and your pooch prefer simple, no-frills grooming tools that are efficient but gentle at the same time, try the Andis Pet Steel Grooming Comb. 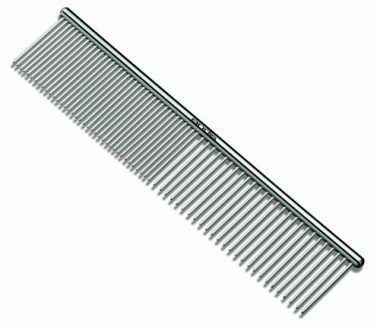 Made of steel, with a two-sided rake, the entire comb is sturdy but lightweight, good for removing mats, as well as for fluffing. One side of the comb is coarse and excellent for removing stubborn tangles and matts, and the other side has fine teeth, which makes it perfect for finishing touches and fluffing up your pooch. Importantly, all teeth are rounded and guaranteed not to hurt your pet as you comb through their coat. The manufacturer states the comb is also great for stimulating skin and hair-follicles, and for massaging your pet. Highly efficient, sturdy, durable and comfortable to use, the Rubold Dematting tool is one of the most popular dog grooming tools on the market. With 17 + 9 precision dematting teeth that are sharp inside and rounded outside, this little brush is a dematting wonder – it detangles, desheds and brushes quickly, gently and efficiently. If you need to dematt some stubborn tangles, start with the 9 teeth side and then switch to the 17 teeth side for deshedding and thinning. The manufacturer promises fast and efficient dematting without any pain for the dog – even pups with sensitive skin are safe with this brush. The handle is ergonomic, non-slip and very comfortable to use. And if you’re wondering about the quality of the product, let’s just say the company offers 100% unconditional lifetime satisfaction guarantee. 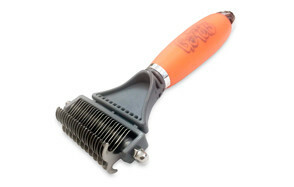 A highly efficient, gentle, affordable and comfortable to use grooming tool? Yes, the Furminator Adjustable Dematter checks all the right boxes. 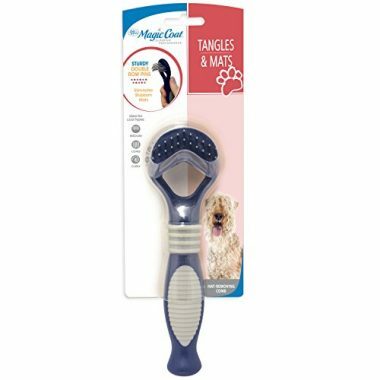 With a curved shape and cut-adjustor, this dog detangler is safe and incredibly easy to use on all coat types and lengths. The cutting edges are curved and made from scratch-resistant, stainless steel that make removing tangles and matts a breeze. There’s no pulling on the skin, irritation and discomfort, so your dog is sure not to hate his grooming sessions with this dematter. To make things even easier, there is an easy-slide tab that locks cut adjustor in place. And finally, the comb is easy to use for you, the pet parent as well, as the non-slip handle is ergonomic. 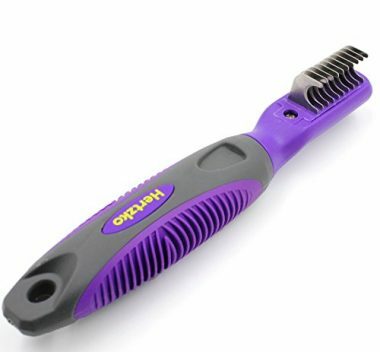 The Hertzko’s dematting comb easily and gently goes through coats of all types and lengths, including thick, wiry or curly hair, short, medium and even long hair, which is why it works great on both dogs and cats. With sharp teeth and curved ends, the brush is efficient at removing knots, mats and tangles while being gentle for pet’s skin. The teeth are stainless steel, meaning they’re easy to clean and sure to last a lifetime. As for the handle, it’s anti-slip and comfortable to hold. The Hertzko’s grooming tool is also great for promoting healthy coat, as it massages the canine’s skin and hair follicles, promoting blood circulation. With a wide-toothed rake that features sharp inner blades and rounded edges, the Pet Republique grooming tool is one of the best undercoat rakes on the market that also does a great job at removing hairy snarls and mats. The wider-than-usual design of this dematter guarantees safe and pleasant grooming experience for your dog, as the sharp teeth don’t pull the hair and irritate skin. In fact, the Pet Repubique’s grooming brush is recommended for pets with sensitive skin, so no worries if your pooch is prone to irritation from most grooming tools – this brush is gentle as it is effective. The non-slip, ergonomic handle provides a good grip and is comfortable to use, while the dual-sided head (6+11 teeth) means this tool can be used for dematting, deshedding and as an undercoat rake. Affordable and convenient, gentle and efficient, the Miu Color pet grooming tool is a great choice if you’re looking to quickly detangle and demat your canine friend on a budget. The tool features a double-sided comb (6 + 11 teeth) with sharp but rounded edges that easily go through messy coat, knots and hairy snarls, without irritating the dog’s skin. 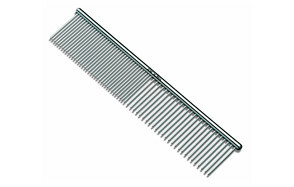 The Miu Color’s dematting comb is a versatile tool that besides dematting can also be used for deshedding and brushing. The teeth are stainless steel, easy to wash and guaranteed to last a long time, while the handle is made from non-slip material and is comfortable to hold. The tool also has a handy little eyelet that makes it easy to store, hang or clip. We’re finishing the product list with the Four Paws detangler – one of the most popular mat removers currently. 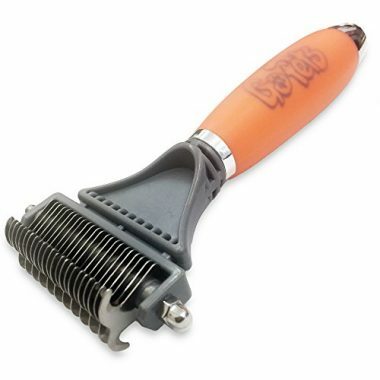 This grooming tool is low-cost, efficient at removing snarly knots and tangles and great at brushing and deshedding. 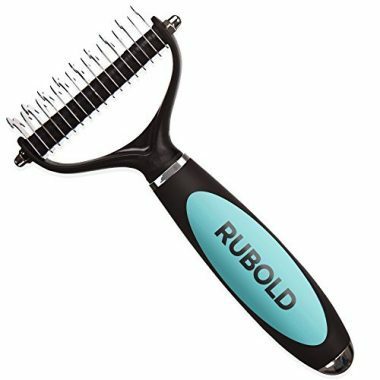 With sturdy, double-row pins, this dematting brush is great for medium, long, wiry and curly coat types. The teeth are sharp enough not to pull hair, and round enough to be gentle at dematting. This is important as you want your pup to sit still for as long as possible during his grooming session. If used regularly, the Four Paws dematting brush will lead to fewer mats and healthier and smoother looking coat. As a bonus, it can be used for long-haired cats as well. Now that you’ve seen our top picks for the best dematting tools for dogs, it should be easier to pick the right product for your pooch. And if it isn’t – no worries, we understand how difficult finding the right product for your pet can be. That’s why we’ve prepared this buyer’s guide and answered some of the important questions when it comes to dematting and deshedding tools. Here, you can read all about the matting, the difference between shedding and matting and how to use grooming tools to help your pet maintain healthy, smooth coat. Don’t forget to check out the FAQ section as well – the more informed you are, the easier will be to pick the best grooming tool. Having a pet is not all rainbows and butterflies – sometimes it’s hairy snarls, tangles, and knots. And when these devil furs become really serious – meaning, when we don’t groom our canine companions regularly – mats happen. Painful, uncomfortable and dangerous, mats can be difficult to deal with, especially if your dog is a wiggler who hates to be brushed and groomed. And make no mistake, the canine who hates grooming most likely hates it because the tool you’re using hurts and irritates his skin. At-home comfort: with a proper dematter, you don’t have to stress your dog by taking him to a professional groomer as you can demat him quickly and easily in the comfort of your own home. To quickly and easily demat your dog, it’s important to follow certain guidelines. First of all, always be gentle so you don’t hurt your pooch. This is especially important if you’re dealing with a young pup or a dog that’s new to grooming in general. Start by brushing your dog gently and slowly. This will allow you to locate mats and start working on dematting your pet’s coat. When you locate a mat, brush the top layer of the fur that is not completely entangled. 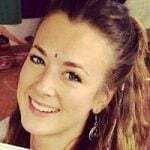 Again, make sure you’re gentle, as we’re not trying to demat anything t this point. If you’re working with a really nasty mat, apply a detangling product if you have any, if not, cornstarch can help. Now break the mat apart with your fingers by lightly pulling away outer hairs while holding the entire clump. Finally, hold the hair below the mat in one hand and take the dematting tool in your other hand. Gently start combing the ends of the matted fur in a picking motion. You don’t want to literally comb through the mats as this can hurt your pet and irritate his skin, but rather tease out the knots. 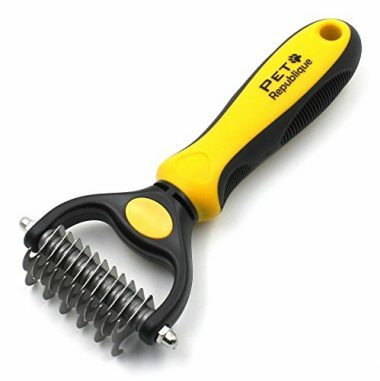 The dematting tool will cut through the matted hair, helping you detangle your pet’s coat. Grooming is an important part of caring for your dog. Depending on the breed, your pooch may shed a little or a lot, but no matter its shedding habits, it’s important to brush and groom him regularly. If you neglect your canine’s coat, knots, tangles and finally mats can develop. Luckily, even if your fur-friend’s coat is in a really bad shape, you can turn things around with a good grooming tool. That’s where deshedding and dematting tools come in. Although both of these brushes do a similar job – remove dead hair from your pet’s coat – they’re not the same. Let’s highlight the differences between the two, so you know which tool is best suited for your pup. Dematting tools come in various shapes and sizes but all have the same purpose – to demat your dog’s mats. To do this, these tools have sharp blades or teeth that cut through the mats, breaking them apart and making them easier to remove. Of course, the teeth cannot be just sharp – they’re also rounded so they don’t hurt your dog’s skin. Still, it’s always wise to use dematting tools slowly and gently to ensure your pet’s safety. Like dematting tools, deshedding tools come in different sizes and shapes. There are wide-tooth combs, bristle brushes, slicker, pin brushes, and many other deshedding combs. 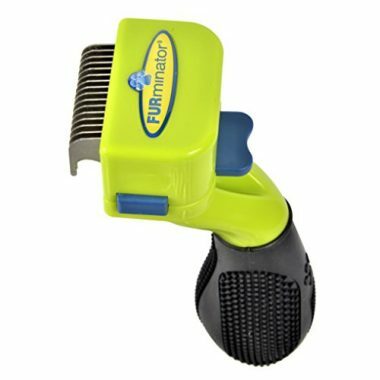 The purpose of this grooming tool is to help you get a handle on your hound’s shedding. Of course, you can never stop shedding permanently, as this is a perfectly natural and healthy process, but you can somewhat minimize and manage unwanted fur. Regular brushing is also a great idea if you want to keep your pet’s coat healthy and tangle-free and prevent matting. A: All dogs shed hair – some may shed a little and some may shed a lot, depending on their breed. Regardless of your furry friend’s shedding manners, if their coat is not regularly brushed, these loose hairs may become entangled, and in time embedded in large masses. Combine that with friction and you get mats. Matting is especially common among dogs with long hair who undergo seasonal shedding, although it may occur in any breed and at any time. If mats are not dealt with immediately, they become large, nasty mats, particularly hard to remove. Therefore, to prevent serious matting, make sure you groom your pet regularly and demat his coat as soon as you notice large clumps of hair forming. Q: Do I need to incorporate dematting into my pet’s grooming? A: If you notice your pooch is developing some suspicious hair clumps, tangles, and knots, it’s time to incorporate some dematting into his grooming routine. Prevention is always better than cure, so to help your pet keep his healthy coat well-maintained, it’s wise to use a gentle dematting tool from time to time, even if he doesn’t have actual mats. Of course, if your dog is not that prone to mats and you brush his coat regularly, there’s no need for using dematting tools. Q: How often should I use a dematting tool? How often she gets knots and mats: if you know your pooch is prone to mats, make sure you demat her coat while brushing her from time to time. What breed your dog is: some dog breeds are more prone to matting, including the Poodle, Cocker Spaniel, Bichon Frise and other long-haired, non-shedding, as well as heavy shedding dogs. How active she is: if your dog plays outside a lot, it’s probably best to use a dematting tool every few weeks. How often you groom your dog: the more you groom and brush your canine buddy, the less of a change she has of developing mats. Q: How do I prevent matting in dogs? A: Removing mats is hard work, both for you and your pup. Therefore, the best thing you can do for your dog’s coat health is not let him develop mats in the first place. To prevent matting, make sure you regularly and thoroughly brush your pooch. This is especially important when it comes to long-haired canines who shed a lot. Generally speaking, all dogs should be groomed on a regular basis, every 4 to 6 weeks, although you can always gently brush your dog every day if needed.